Fit-Ink: Play Hooky and Ski! Lift lines, crowded runs, hiked-up hotel rates, struggling to find a place to sit at lunch, traffic delays (especially if you're an I-70 regular in Colorado). If you've skied your favorite resort or explored a new one over the weekend (and who hasn't? ), you know these are part of what comes with skiing on Saturday and Sunday when everyone seemingly is off work. You've learned to accept it, but even the best of the weekend warriors want to ski at least once in the middle of the week when everyone else is at work. 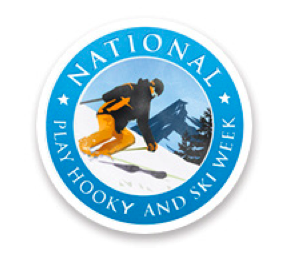 If you needed an excuse for taking those mid-week runs--and holidays don't count--here's one: the third annual National Play Hooky & Ski Week. Running from Monday, March 3 to Friday, March 7, Play Hooky & Ski Week is your chance to ski when your buddies are still at work--unless you convince them to come too--and find corduroy at noon and make fresh tracks in the late afternoon because the crowds are thinner and less likely to hunt down every last powder stash on the mountain. I already snuck out once this season--so what if it was yesterday--and next week can't come soon enough. And Liftopia, the largest online and mobile marketplace for lift tickets and other mountain activities, is only encouraging you to get out and ski to relieve some of that stress that piles up this time of year in the workplace. It's easy to see why Liftopia's customers love the Play Hooky Sale: the lift ticket savings are too good to pass up. Skiers and boarders shopping Liftopia's website or mobile app can find lift tickets starting at $7.50 and as much as 78 percent off walk-up window rates at ski resorts across the country. Mt. Baldy in California: Save 76 percent with two-day lift tickets starting at $33.99. Sunlight Mountain in Colorado: Save 35 percent with lift tickets starting at $35.99. Crotched Mountain in New England: Save 60 percent with lift tickets starting at $19.99. Sundance in Utah: Save 44 percent with lift tickets starting at $30.99. Caberfae Peaks in the Midwest: Save 78 percent with lift tickets starting at $7.50 (crazy that a lunch on the mountain could easily cost more!). Mt. Hood in Oregon: Save 53 percent with lift tickets starting at $37. Or play hooky from work for the whole week and enjoy multi-day deals at resorts like Tremblant, Sun Valley, Blackjack, Park City, Snowbird, Whiteface, Copper Mountain, Diamond Peak and more. Ready to start planning that getaway? Find more deals at Liftopia before they're gone. And maybe you'll get lucky enough to experience some of those epic powder dumps you can only dream of skiing when you're scrolling Facebook at your desk. A girl's gotta dream, right?